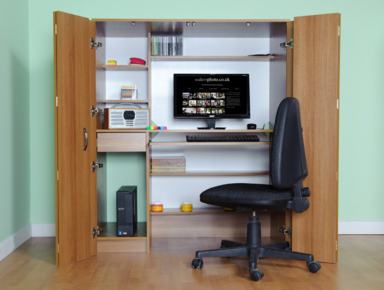 The desk enables you to have all the functions of a Home office, but the pleasure of closing the doors at the end of the working day and hiding all the clutter away. I wanted all my computer stuff everywhere most of my life, but I’m increasingly seeing the appeal of something like this. Aside from having an uncluttered appartment, I like the idea of having a little workstation space to myself that I could arrange with all my peripherals and the precious few computer books I’ve kept. Better still, wouldn’t it be great having one of these setups and only having vintage gear in it? You could have a time capsule, with DOS books and everything! Hmm, wonder if they ship halfway across the world? I know a plane they could shove it on.